Companies, especially in the financial services industry are investing in the anti-money laundering software to effectively track the transactions and eliminate the risk of fraudulent. Companies offering anti-money laundering software are also focusing on providing effective and efficient software including currency transaction reporting software, transaction monitoring software, compliance management software, customer identity management software in order to meet critical business requirements and simplify complex operations, thereby minimizing the risk associated with the business. Increasing adoption of anti-money laundering software in developing countries and robotic process automation in anti-money laundering software and KYC are some of the factors fueling the market growth. Anti-money laundering software predictive models are also helping banks to manage risk by using advanced features. Banks are also increasingly adopting anti-money laundering software with KYC analytics in order to properly understand, manage the flow of data. Money worth of approx. 2-5% of the global GDP is laundered in a year, ranging between $800 billion to $2 trillion, according to the United Nations Office on Drugs and Crime (UNODC). Key players in the global anti-money laundering software are NameScan, a member of the Neurocom group, Siron, Verafin Inc., NICE, BAE Systems, ACI Worldwide, Inc., Trulioo, Ascent Technology Consulting, EastNets, FICO TONBELLER, Experian, Oracle Corp, Opentext, SAS Institute Inc., Accenture Inc., and Fiserv, Inc.
As per the latest report by Transparency Market Research (TMR), the global anti-money laundering software market is expected to witness robust growth. The market is also projected to record an exponential CAGR of 12.1% throughout the forecast period. The global anti-money laundering market is also expected to generate the revenue of US$ 4,262.0 million by the end of 2026. 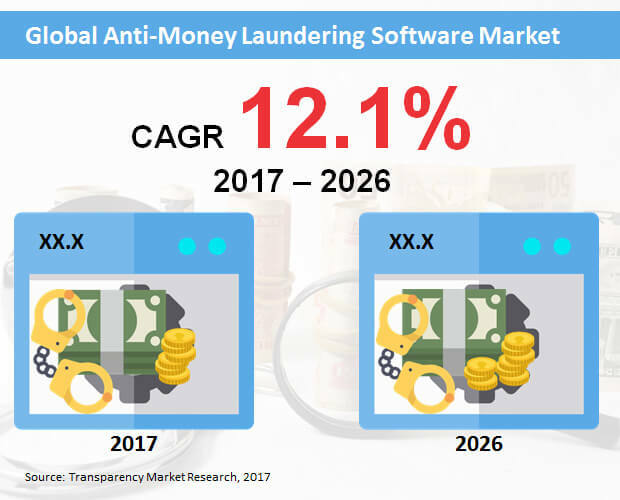 The global anti-money laundering software market is segmented into deployment type, solution type, end-user type, product type, and region. On the basis of product type, the market is further divided into Compliance Management Software, Transaction Monitoring Systems, Customer Identity Management Systems, and Currency Transaction Reporting (CTR) Systems. Transaction monitoring systems is expected to witness the highest growth during the forecast period. By end-users, retail banking is anticipated to be the largest user of anti-money laundering software during 2017-2026. Based on the solution type, among various solution types, transactional monitoring is likely to witness significant growth in the coming years. Deployment type is further segmented into on-premise, and cloud-based. From these two segments, on-premise is expected to be the most preferred deployment type during 2017-2026. North America is expected to remain dominant in the global anti-money laundering software market. The financial institutions in the U.S. strictly follow customer identification program to verify each customer, thus reducing the money laundering. Owing to the technological advancements the use of anti-money laundering software with advanced features has increased in North America. Also, the laws regarding anti-money laundering require financial institutions to have the customer identification and anti-money laundering program. Hence, leading companies are developing software that can help financial institutions to meet anti-money laundering and Bank Secrecy Act requirements.